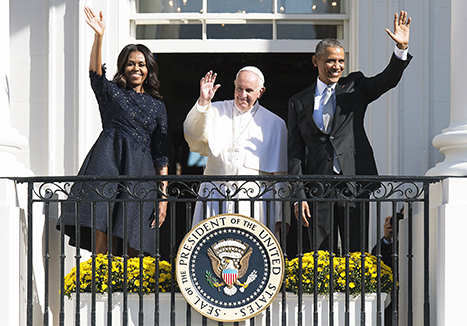 President Barack Obama received Pope Francis on the South Lawn of the White House and greeted his Holiness with praise for Catholic social justice in action. Unfortunately, the President did not display gracious hospitality when choreographing the 15,000 person guest list. Pope Francis believes in the Ignatian notion of encounter and dialogue but prominently announcing these guests seemed to just stick a finger in the guests' eye. Vatican officials pushed back against these provocative invitations. The concern was having the Holy Father pushed into pictures with such Catholic teaching dissenters to cause controversy or imply acceptance. When Pope Francis landed at Joint Base Andrews and was greeted by President Obama and family, there was an unscheduled twenty meeting between the Holy Father and the President. It is unknown what was discussed. However, the pontiff did not greet any civilians gathered on the White House South Lawn. 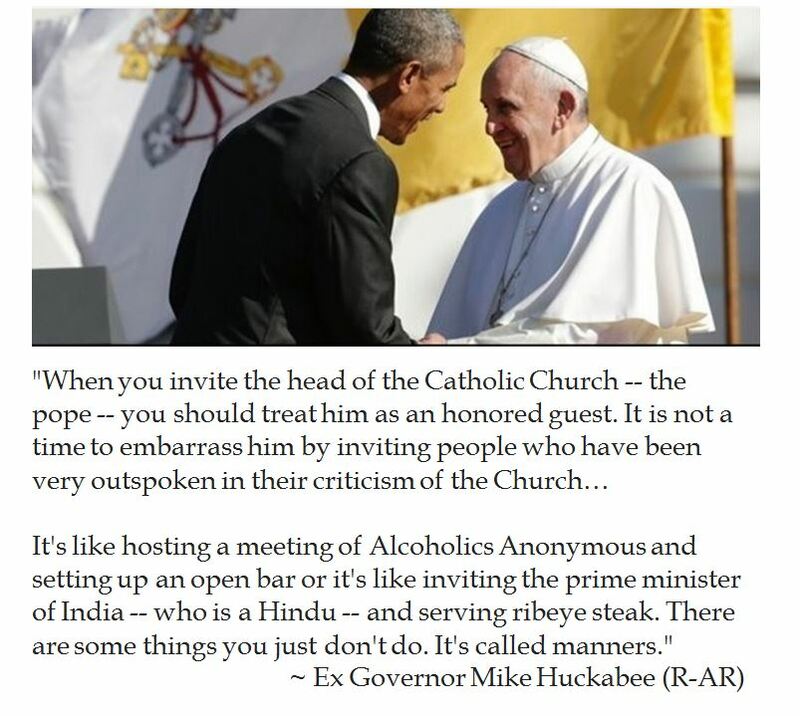 Republican Presidential hopeful former Governor Mike Huckabee (R-AR) used folky analogies to convey the classlessness of the Obama Administration's invitations. Reverend Franklin Graham also questioned "sinful" the Obama White House's tactics for the Papal visit. There is a cognitive dissonance between the kind words which America's Chief Executive spoke and his uncultured special guest list. During his White House speech, Pope Francis spoke warmly about combating climate change and helping the maginalized in American society, including immigrants. But Mr. Obama's passive aggressive attitude towards Pope Francis diminishes any alliance on social justice issues to try to score cheap political points with the LGBTQQ? activists. At least the protocol person at the White House did better with State gifts than in the past. When President Obama visited the United Kingdom at the start of the Obama Administration, the White House gave Queen Elizabeth a MP3 player full of Obama speeches and the sight impaired Prime Minister a collection of Region 1 DVDs of American films. When Mr. Obama visited the Vatican last year, he gave the Vicar of Christ a box of seeds. For Pope Francis' visit to the White House, the Vatican was given a one of a kind statue of an ascending dove which incorporates the armature from the Statue of Liberty and is on a pedestal carved from reclaimed wood from the White House. That gift was thoughtful, symbolic and precious. The White House also presented a 206 year of key from St. Elizabeth Ann Seaton. That might get filed along with 1920s American Catholic bingo records in the Vatican archives. In exchange, the Holy Father gave Mr. Obama a bronze bas relief plaque for the 2015 World Meeting of Families in Philadelphia, which was the main reason that Pope Francis traveled to America for the first time. Post Scriptus-- The Pope arrived late for his appointment at the White House. It is easy to assume this was just do to the Holy Father giving quality time to the students standing near the Nunciature. However, a more cynical take may be that such a delay conveniently caused a South Lawn receiving line photo-op to be cut from the itinerary. One wonders why the White House made such a big deal about the special guests, yet there was no receiving line nor photo ops with the crowd. It is interesting to attempt to understand Trump’s fanatical support. I assumed that it mainly consisted of disgruntled Tea Party types who are disgruntled with the “Surrender Caucus” which currently rules Between-the-Beltways. After the Second GOP Debate, however, social media Trump-etteers give a different impressions– unprincipled, uninformed, obnoxious and ultimately alienating. In other words, tending to be troll-like. One abrasiive interlocutor touted former one term Congressman Col. Allen West (R-FL 22nd) as being the right choice for Trump’s VP, She dismissed the possibility of having the former Florida Congressman as a replacement Speaker of the House if Boehner loses the Vacate the Chair vote for an unusual reason. Not the unlikely novelty of electing a Speaker who no longer is a member of the House. But this Trump true believer tweeted: “The Speaker is just a vote counter spot and [Allen West is] more valuable than that.” Hmm. That was a novel, if not naive, understanding of American government. So I chimed in noting that the Majority Whip is the House Republican vote-counter whereas the Speaker sets the agenda, acts as the face of the House and is third in line for the Presidency. The social media shrew sarcastically claimed that she didn’t need to be schooled. Really? Yet I did not want to inherently alienate an anti-establishment Republican, I replied: “If you knew then you would not have asserted that House Speaker is just a vote counter. Sorry” Even this attempt at an olive branch gave umbrage yet this troll still wanted to blurt out more bile and incorrect assumptions on how the lower chamber works. My viewpoint was denigrated because I was too DC. It seems that a handle like CalamityDC is too subtle of a protest to business as usual in the District of Calamity (sic) for that Trump-eteer. Her cyber comrades in arms claimed to block me because “You can’t fix stupid.” What a way to win friends and influence people! My heart certainly does not break for being blocked by a Trump-eteer troll. But I have to wonder what is the objective of these online activists? I was not even questioning the merits of their desired nominee. I interjected with obective process information, yet Trump-eteers took it as an attack and made me the campaign equivalent of Scientology’s Suppressive Person (SP). 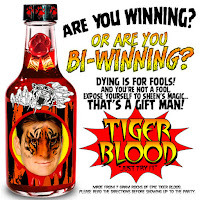 Guess that coalitions or even winning more Republicans is unnecessary to their bewitched beliefs. 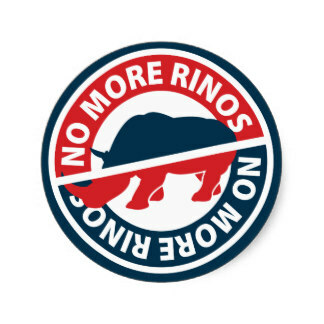 Another close encounter of the social media kind was with a guy whose handle is “No More RINO Excuses”, but he was juxtaposing Donald Trump to Senator Rand Paul (R-KY). This struck me as strange that a libertarian Republican like Dr. Paul was labeled a Republican in name only. Fleshing out the dispute, the Trump-eteer disliked Dr. Paul’s disengagement from foreign military entanglements. But the poster asserted that Mr. Trump would have a robust military. I asked to be educated how this would be done, as Mr. Trump has only pronounced platitudes in his two debate performances and his so called major Foreign Policy speech (which only lasted for ten minutes) aboard the U.S..S. Iowa. The Trump-eteer inquired if I watched the debate. Of course I had but I noted that it should be easy for him to tick off the specifics. Naturally, the Donald had not done so other than cite the slogans “Winning”, “Make America Great Again” and “I build the best military that I won’t even have to use it.” When pressed for specifics, the Trump defender claimed that no candidate offers specifics at this time. I observed that Carly Fiorina was quite specific about battalions and troops at the Reagan Library debate. And I’ve even heard Dr. Ben Carson talk about replacing the Ohio class submarines. What made me prick up my ears was how the flustered Trump-eteer suggested that I ask “The Donald” myself as I would be happier with his answers. Sure. This is a social media activist posting numerous pieces to support his candidate and thinks that a skeptical questioner is going to get the equivalent of “face time” with the candidate. I saw another active social media commentator who sent hundreds of anti-Fiorina messages, accusing her of proliferating nuclear materials to the Persian Gulf. When others asked what was his sourcing, the standard answer was a stonewall: “Do your own homework”. OK. Pugnatious, smearing and ambiguous. Masochistically, I read a day’s worth of his reposts and messages to confirm who was his candidate. Unsurprisingly, the diatribes started soon after the Reagan Library debate, pointing to an internet poll which purported that Trump beat Fiorina big league, so to speak. Similar internet polls claimed that in 2008 and 2012 that ex Congressman Ron Paul (R-TX 22nd) won huge victories after his debates. Perhaps these are three isolated examples, but these experience underscores Rich Wilson’s warning about not allowing the Republicans to be co-opted by Trump’s Troll. Like their leader, Trump-eteers love to point to the polls which have the billionaire with a Huuuge lead. They don’t appreciate being challenged on the cross tabs. Aside from discerning if it is a national poll (which means nothing more than name recognition) or a state poll. Then there is sample size, party affiliation, percentage of undecided voters, being registered or a likely voter etc... As silly season (the summer before Presidential primary season) ends, celebrity status driving name recognition wanes and voters get serious about their support for candidates to the Oval Office. These exchanges relish the fight and refuse to give in, despite not having the fact on their side. That seems jesuitical. These internet exchanges do not seem based on constitutional principles. Nay, one gets the impression that details do not matter or ignorance on the interworkings of our Constitutional Republic. These cyber shock troops will brook no dissent nor take no prisoners. 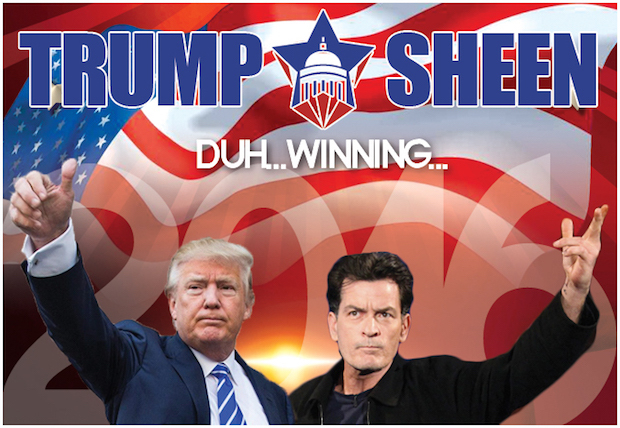 Such agitated activists would probably support having Charlie Sheen as Trump's as Vice President because of "Winning". This is not out of the realm of possibility as the star of Anger Management is willing to be Trump's VP. During an interview by Glenn Beck, social media expert John Cardillo analyzed the fervent support of Trump-eteers. Cardillo opined that they were not Tea Party supporters but were part of 4-7% of Republican supporters with an identity crisis. 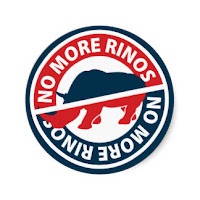 They are tired of losing and turn their anger towards the Republic Establishment without having defined goals or base principles. It is easy to liken this to rivid men of action during times of trouble in Western Europe in the aftermath of The Great War. A charismatic leader who confidently promises to make the trains run on time can utilize such unquestioning foot soldiers as well as dispense of them when it becomes too inconvenient. Beck tends to think that the world is going into a very rough patch and that the polity has been framed in a top down/bottom up/inside out paradigm which creates chaos. That is when the masses cry out for a strong man to make all the tumult go away, and perhaps making our Constitutional Republic go away in the process. While politics is a favorite contact sport in the District of Calamity (sic), it must be admitted that poltics is not a beanbag sport. Prolonged primary campaigns involve endurance, strategy, building support, formulating and articulating proposed policy, persuading voters and getting out the vote. It can get rough and tumble in the primary trenches but in the end, it is hoped that the party can come out unified and offer an appealing vision which wins over Independents and undecided voters and becomes victorious. But the vacuity and vituperativeness which seems to characterize Troll Party elements calls those political precepts into question. In that case, is “Winning” just an empty boast like drinking tiger’s blood? The current Republican field has a baker’s dozen of serious candidates that have anti-establishment animus would appeal to Tea Party Sympathies (Carson, Cruz, Walker, Paul, Jindal). Thus the Tea Party vote is currently fragmented. Winnowing of the primary field field may allow a coalescing around a couple of strong candidates who espouse Tea Party values. But if the Troll Party overwhelms the Grand Old Party, it may be impossible to bridge the political chasms which divide Ameicans as the path will be blocked by untamed trolls. That may well be a bridge too far for principled constitutional conservatives. The Star Spangled Banner-- Sing It America! Last year was the bicentennary of the penning of Francis Scott Key's of the Star Spangled Banner. Our National Anthem is based on a poem "The Defense of Fort McHenry" about the bombardment of Baltimore by the British during the War of 1812. The British had just burned Washington, DC and their forces were heading North to beat "rebel" American forces in Baltimore. What stood in the way of British military dominance was Fort McHenry, which blocked warships from entering Baltimore harbor. 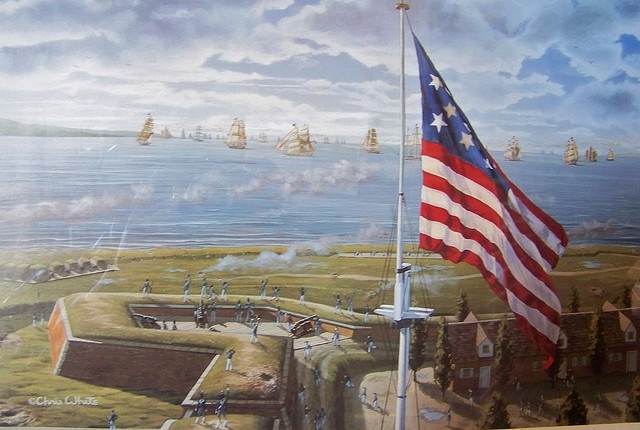 The British bombarded Fort McHenry for 27 hours. Key was aboard a Royal Navy warship negotiating the release of a prison. During the aerial siege, the American lawyer was taunted that soon the Stars and Stripes would be replaced by the Union Jack. On the dawn of September 14, 1812 when Francis Scott Key saw the American flag still flying over Fort McHenry, he was inspired to write: 'Oh, say does that star-spangled banner yet wave, o'er the land of the free and the home of the brave?". Shelli Manuel, an accomplished musician and vocalist, was inspired to educate people about the Star Spangled Banner when she interviewed Baltimoreans about the National Anthem in the city of the song's birth, yet 80% of the adults and none of the youths knew any of the verse. No wonder people chuckle nervously at scene in The Naked Gun (1988) when Detective Frank Drebin stumbled along when singing the Star Spangled Banner at a ballgame. 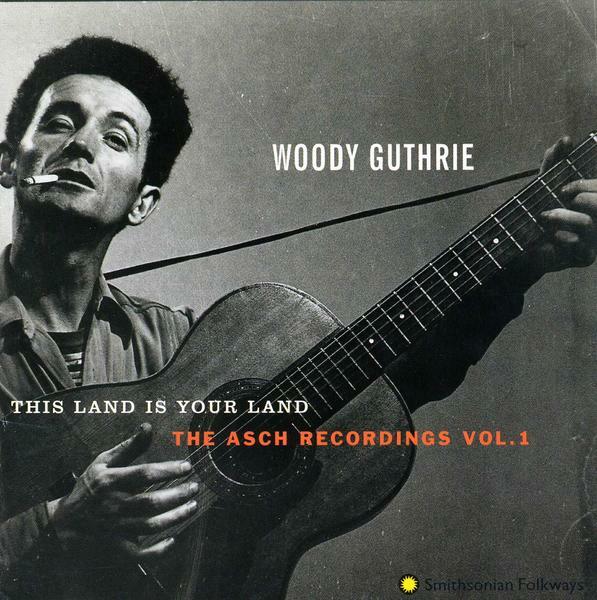 There have also been movements to replace the Star Spangled Banner as the National Anthem with the Woody Guthrie folk song "This Land Is Your Land" (1940). Guthrie's ditty was written in reaction to his repulsion to hearing Kate Smith sing Irving Berlin's "God Bless America" (1918) on the radio, as he thought that the lyrics were unrealistic and complacent. Guthrie tinkered with the tune to occasionally include overtly political verses which showed communist sympathies. It may be a fun song to sing around a campfire but does it really depict universal American values? 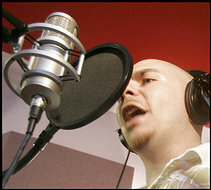 In 2006, there was a push by a bunch of Latino pop stars like Pit Bull and to make "Nuestro Himno" a de-facto hip-hop Hispanic National Anthem. Clearly, a Spanish version of a National Anthem takes away from the unity of one song brings a nation. This was foisted on the public in the midst of the 2006 push for Comprehensive Immigration Reform. What a way to Balkanize the country! But there is also the trickiness of translation. The first stanza of "Nuestro Himno" was fairly accurately rendered, although references to bombs and rockets were referred to as "fierce combat" so as not to sound too militaristic. However, the second stanza seems to totally rewrite Key's lyrics, expressing "we are equal, we are brothers." An alternate version of "Nuestro Himno" including rapping in English exhorting: "Let's not start a war With all these hard workers They can't help where they were born." Did they channel Woody Guthrie with some Latino flair? Fortunately, Nuestro Himno got mixed reviews and seems to have faded into the sunset. In 2014, Miley Cyrus backed a "We the People" petition to President Obama to change the National Anthem from the Star Spangled Banner to "Party in the USA". Of course that publicity stunt should have been taken as seriously as Miley Cyrus would be by a Music Conservatory. Still, the petition only fell 90,000 votes short of being addressed by the White House. Shelli Manuel and the Veterans of Foreign War also muted this mutiny of our National Anthem. Why is it that there are multiple moves to replace the Star Spangled Banner as America's National Anthem? Obviously, education is a key component for the anthematic cognitive dissonance. Our educational system seems to stress social history in lieu of patriotic concentrations. Moreover, students are conditioned to consider the United States a warmonger, misinterpreting the "bombs and rockets" as aggression rather than standing in self-defense. Another aspect which people wonder "What the Hail?" about our National Anthem is the tune. Key was a lawyer and poet, not a composer. Hence he borrowed the already established tune "The Anacreontic Song" (To Anacreon in Heaven). Unfortunately, that was a popular English tavern tune which was used as a sobriety test-- members could be refused another round if sang off key or flubbed the lyrics. Key ought not be chagrined at borrowing popular melodies, as that is what Guthrie did for "This Land Is Your Land" too. 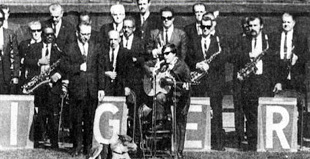 There has been some consternation about stylized instrumental arrangements of the Star Spangled Banner, like Jimi Hendrix guitar solo rendition at Woodstock (1969) or Jose Feliciano's soulful arrangement at Tiger Stadium during the 1968 World Series. 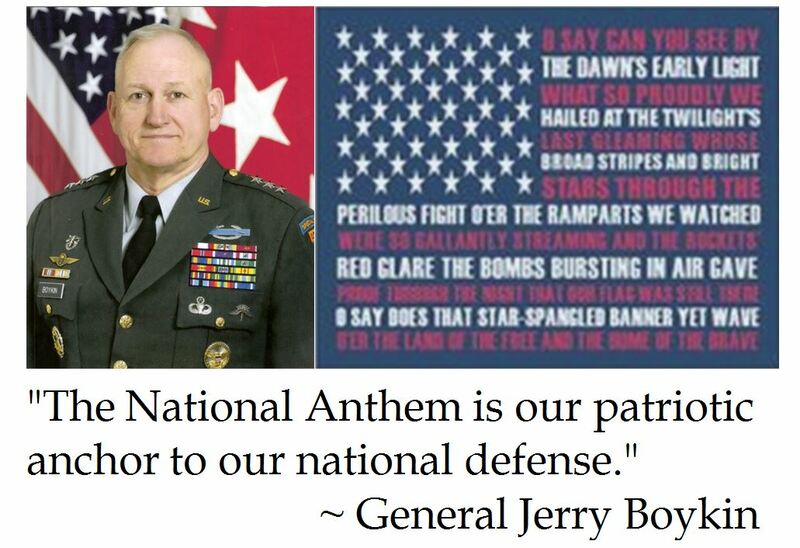 Tastes can differ but so long as the musician does not make a mockery of the National Anthem like Rosanne Barr did in 1990, we can tolerate it so long as the lyrics are not butchered or altered. To combat this ignorance and indolence about the Star Spangled Banner, Shelli Manuel took a multi-faceted approach. 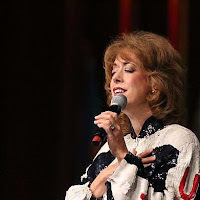 After singing at a subdued 2014 bicentennary celebration for the Star Spangled Banner in Baltimore, Shelli Manuel sprang into action. Manuel organized Sing It America to educate the public about our National Anthem. The group convinced the United States Senate to honor and give thanks to the Star Spangled Banner to have a year long celebration of the Star Spangled Banner. Moreover, Senate Resolution. 550 (2014) expresses the Senate sentiment that all the current verses of the Star Spangled Banner remain the National Anthem in perpetuity, including the "Forgotten Prayer Verse". 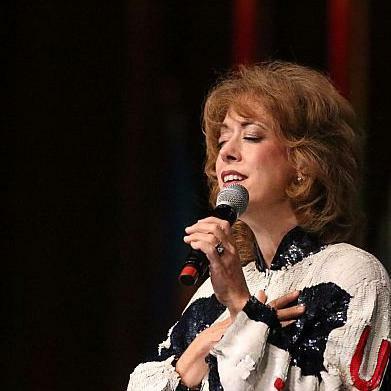 But aside from symbolic Senate votes, Sing It America launched a comprehensive educational program to help students learn about the Star Spangled Banner. In the Bicentennial year, the National Symphony Orchestra premiered a new symphonic arrangement of the Star Spangled Banner at "A Capitol Fourth". But Shelli Manuel wanted to demonstrate that the Star Spangled Banner can be performed well in a variety of arrangements and settings. So Sing It America arranged a Marathon 24 hour celebration of the Star Spangled Banner on the 201st anniversary from 5am to 5am on the National Mall in front of the Lincoln Memorial. Dozens of groups will sing the National Anthem every hour on the hour. This dedication to the Star Spangled Banner shows that the National Anthem is not just a pro-forma tradition before sporting events. The Sing It America Marathon and educational efforts invite Americans to deeply enter into the meaning of the Star Spangled Banner and see the lyrics of our National Anthem as a credo reflecting our freedom, our history, acknowledgement of Divine Providence, and self defense. While there is nothing new about Welles Remy Crowther's aphorism from his high school yearbook, the way that he put the maxim into action in his life was remarkable. 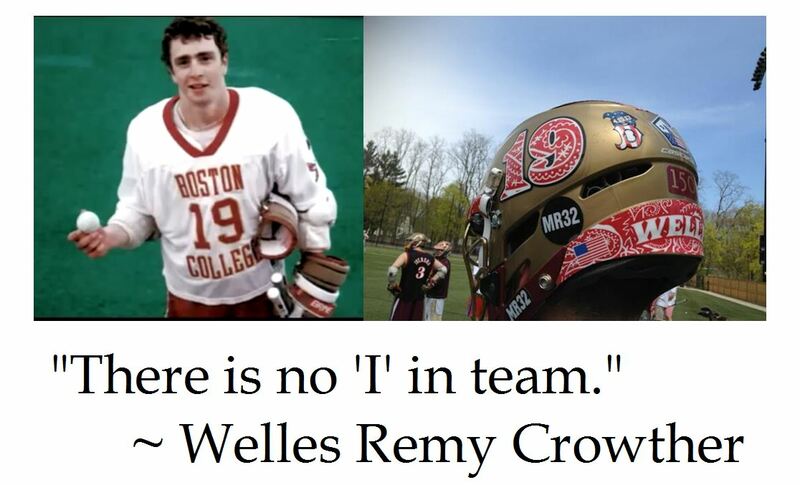 Welles Crowther was a lacrosse player in secondary school in Nyack New York and later for Boston College's varsity team. Crowther was associated with always wearing a red bandanna, a penchant he acquired as a child. Due to his smaller stature, Crowther was physically overmatched by his competitors, but made it up with enthusiasm and teamwork. On September 11, 2001, a 24 year old Welles Crowther was at his office on the 104th Floor of the South Tower of the World Trade Center when the first airplane struck the other building. That horrible event prompted him to put his professional pursuits aside and channel teamwork. Crowther was on the 78th floor Sky Lobby of the South Tower when the second plane struck. Crowther striped to a t-shirt and wore a red bandanna to cover his nose and mouth. Crowther immediately acted as an impromptu team leader to rally the walking wounded to a functioning stairwell. Survivor Judy Wein remembers hearing: "Anyone who can walk, get up and walk now. Anyone who can perhaps help others, find someone who needs help and then head down." Crowther was seen carrying a woman on his back. He led them down to the 61st floor where they were met by First Responders who got them to a functioning elevator on the 40th floor and the rest of the team escaped the towering inferno. After escorting people down 16 flights of stairs, Crowther ascended the stairwell again to help more "team mates". Crowther's group of First Responders had the "Jaws of Life" and were prepared to lift debris to help trapped victims. According to survivors, Crowther's remains were found with other firemen who were on the 78th floor Sky Lobby when the South Tower collapsed. Crowther's courage and teamwork may have saved a dozen lives. Crowther's story might have been lost in the alluvia of fragmented memories of 9/11. But six months after the atrocity, the New York Times published an account from a survivor who remembered a detail about a mysterious man with a red handkerchief organizing a makeshift triage. This red bandanna memory gave Crowther's grieving parents some solace about their son, simultaneously providing closure and confirmation of their son's solid character. In 2006, Welles Crowther was posthumously named an honorary New York Fire Fighter for being a 9/11 Angel. Boston College sponsors an annual Red Bandanna Run for the Welles Crowther Trust. The American Heroes Channel will soon award an Inaugral "Red Bandanna Award" for exemplifying the American spirit during a nationally televised Boston College football game on September 18th. So often, sports can become base, reduced to a boxscore, vexing whether the home team will make the playoffs or speculating about the latest New England Patriots scandal. But sports can be much more than those pedestrian pastimes. As we reflect on the anniversary of 9/11, Welles Crowther's exemplary life shows the deep values that can be derived by sports. Welles Crowther's dedication to teamwork was cultivated by coaching on the field but was inculcated into his life. Crowther not only thought of others at a tragic time, but was conditioned to rally and help "team mates" at a test match of life. While the cynical may smirk at the truism that "There is no 'I' in team", Welles put that principle into practice sacrificing his life for the sake of others. Those are the virtues which make sports meaningful.